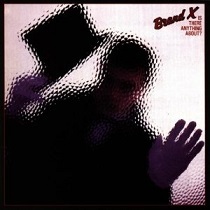 Review: "Brand X: Is There Anything About? (reissue)" - Sea of Tranquility - The Web Destination for Progressive Music! UK label Gonzo Multimedia are in the process of releasing some rare recordings from the Brand X and Percy Jones camp. This one, Is There Anything About? was originally released back in 1982, not long after the band delivered their popular Do They Hurt? album and then subsequently went their separate ways. Problem is, the band still owed their label another record, so they went into the vaults and found some rarities and unreleased material that ultimately became Is There Anything About?. The musicians contained on the album include Phil Collins (drums), Percy Jones (bass), John Goodsall (guitar), Robin Lumley (keyboards, vocals), Peter Robinson (keyboards), John Giblin (bass, whitbread, vocals), Raf Ravenscroft (saxophone), and Steven Short (syndrums, vocals). While far from an essential Brand X release, there is still some strong material contained here. "Ipanaemia" is a bouncy jazz-fusion track littered with tasty guitar licks from Goodsall and Collins deft touch on the drums. "A Longer April" is a nice showcase for the emotional sax work of Ravenscroft and Giblin's elastic bass lines, while "Modern, Noisy and Effective" features some soul searching synth melodies courtesy of Lumley...anything but noisy actually. The band gets into a deep funk groove on the upbeat "Swan Song", a nice vehicle for Giblin's muscular bass and Goodsall's guitar licks. The legendary Jones makes his first appearance on this CD with the excellent title track, as he and Collins plow through some intricate rhythms before Lumley and Goodsall join in on the fun on this funky fusion burner. "Tmiu-Atga", short for 'their making it up as they go along', features Lumley, Robinson, and Giblin, ultimately resulting in a synth & programmed drum piece that has a very dated, early '80s feel. Not terrible, but clearly missing Goodsall & Collins. More of a curiosity piece and littered with hit & miss material, Is There Anything About? nonetheless contains a few gems that any Brand X fan will want in their collection. Percy Jones is criminally absent from most of these recordings, but that's no slight on Giblin, who is also a fine bassist. Also, if you are looking for the raging guitar talents of Goodsall, he's rather tame here, as is Collins on drums. 5) Is There Anything About?